A significant diplomatic building, with a variety of accommodation. 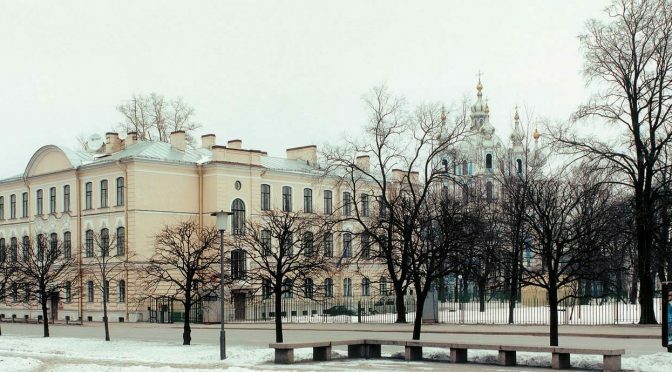 These consulate offices were converted from an existing music school, set within a beautiful park, adjacent to the Smolny Cathedral in the centre of St Petersburg. The project also involved the alteration of a 19th-century merchant’s apartment building to form consular staff accommodation. Both these properties are located within the city’s conservation area. The principal rooms, behind main elevations, were restored to their original splendour while alterations were restricted to lesser spaces to the rear of the building. The civic elements of the project were complemented by two residential components. Firstly in the alteration and fit-out of the consul general’s residence on the top floor of the consulate, comprising private and public wings. And secondly at Kovensky Pereulok, where residential accommodation of a very high standard was provided for consular staff through the refurbishment of 19th-century grand apartment buildings.